Bernard Blommers was the only son of lithographer Pieter Blommers, who operated a print shop in The Hague. 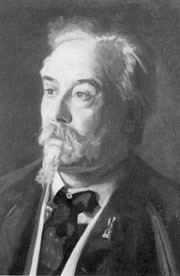 Born on January 31, 1845, the young boy learned lithography from his father, but eventually expanded his education to include painting at The Hague Academy of Art. There, he studied with Johan Philip Koelman, a politically active artist who had worked extensively in Rome in the 1840s, returning to Holland after 1851 to accept the teaching position in The Hague. In 1868, after five years in Koelman’s studio, Blommers further broadened his skills in the studio of Christoffel Bisschop, where he absorbed his instructor’s fascination with the accomplishments of seventeenth-century Dutch painters, especially the rich tradition of genre painting. Bisschop’s own work, such as The Sunbeam (Metropolitan Museum of Art, New York), clearly displays this predilection for interior genre scenes with a strong focus on dramatic lighting. As a novice painter, Blommers revered this characteristically Dutch visual tradition, but he would soon develop his own style as part of the new ‘modern school’ at The Hague. During this early phase of his career, Blommers met the Maris brothers, (Jacob, Matthijs and Willem) forming a particular friendship with Willem, the youngest of the three. Together, they journeyed along the Rhine River, painting and sketching the charming villages and scenic perspectives as viewed from a boat on the river. On returning to The Hague, they shared a studio until both of them married in the early 1870s. Blommers also made his first trip to Paris in 1870, staying with Jacob Maris, who had been living there since 1864. Despite the political upheaval of the 1871 Franco-Prussian War, Blommers seems to have formed an affinity for the city, returning many times throughout his life for extended visits. Blommers early career was particularly notable for his focus on images of fisherfolk from the village of Scheveningen, located just outside of The Hague. It was there that he met Anna van Toorn, whom he married in 1871, and there that he established a studio with a reconstructed interior of a fisherman’s cottage. It was also at Scheveningen that Blommers began to develop his own individual style, painting a variety of scenes that featured the modest lives of the local people. One of these paintings, Where Are the Little Doves? (location unknown) attracted favorable critical attention from Jacobus van Santen Kolff, who noted that it was “deeply poetical through an intensity of feeling and truth.” [i] The success of these early fishing village scenes brought Blommers a comfortable life, and eventually worldwide recognition. By 1882, Blommers was regularly selling his paintings through Knoedler’s Gallery in both Paris and New York. Beach scenes, such as Fish Auction, captured the everyday life of Scheveningen’s residents, offering viewers a glimpse of the hard-working men and women who made a living from the sea. Over the course of the decade, he developed an increasingly tonal palette with broad brushstrokes and a more painterly approach. His many images of children playing on the beach reflect this shift in both color and technique; the sky and water blend seamlessly as the children play unassumingly on the shore, entirely nonchalant about their father using them as his models. As his family grew, and as the region around The Hague became increasingly urbanized, Blommers moved to the fishing village of Katwijk, about ten miles north of the city on the North Sea. This small seaside town had long been attractive to painters because of its sandy beaches and expansive views of the North Sea, but in the late nineteenth century, Katwijk became one of the largest artists’ colonies in Europe. Between 1870 and 1914, there were approximately 1,100 artists in residence at some time during the year. [iv] Most were visitors who stayed at one of the two local hotels, but some, like Blommers, decided to settle there permanently. With an international community of artists from Europe as well as the United States and Japan, Katwijk was soon hosting a regular program of exhibitions in a large building in the center of town under the auspices of the newly created Katwijk Art Association. Blommers’s home on the village’s main boulevard became yet another center for The Hague School, welcoming friends and colleagues who arrived to paint the Katwijk landscapes. Responding to the reporter’s question about the European art divisions between academic and “secessionist” art, Blommers offered this observation: “The young painters get an academical training and at first paint in the way they are taught; but that soon passes. Then they realize they must find their own natural method to express themselves. I am a member of the Munich Secession, so I suppose I am an impressionist, or a plein-airist, or whatever you choose to call me. Oddly enough, however, I have never visited Munich, where my pictures are so well known. I have always wandered to Paris, to London, to Scotland—and here at last I am in America, where I have so often longed to be?” [iii] In October of 1904, Blommers had an opportunity to demonstrate his “impressionist” work in an exclusive exhibition entitled “The Modern Dutch School, Paintings by Recent and Living Masters of the Netherlands” at the Scott and Fowles Gallery, 295 Fifth Avenue in New York. Only twenty-five paintings were shown, all of them from members of The Hague School, including Blommers’s Waiting for Boats. The pattern of exhibiting at least once yearly in New York would continue until the onset of World War I. After completing the portrait of Carnegie, and visiting two of their children who were living in the US, Blommers and his wife returned to Katwijk just as European geopolitical tensions were about to erupt into war. Blommers continued to paint for another year, until his death on December 15, 1914. [i] J. van Santen Kolff, ‘Een blik in de Hollandsche schilderschool onzer dagen’ [A look at the Dutch school of painting of our times], De Banier, ii (1875), 328–30. [ii] New York Times, “Impressions of America on a Dutch Impressionist,” May 1, 1904. [iii] New York Times, “Impressions of America on a Dutch Impressionist,” May 1, 1904. [iv] The Katwijk Museum has documented the number of artists based on hotel registers and local property records. 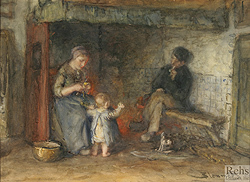 See http://www.katwijksmuseum.nl/ See also, Nina Lübbren’s Rural Artists’ Colonies in Europe, 1870-1910, (New Brunswick, New Jersey: Rutgers University Press, 2001). [v] New York Times, “Dutch Artist, Here to Paint Carnegie, Talks on Art,” April 14, 1912. [vi] New York Times, “Here to Paint Carnegie,” February 20, 1912. [vii] New York Times, “Here to Paint Carnegie,” February 20, 1912.